Musings of a Menopausal Melon - mmm! quilts: Bad to the Bone - scratch that: Pleasure-Seeking Sewer! Bad to the Bone - scratch that: Pleasure-Seeking Sewer! 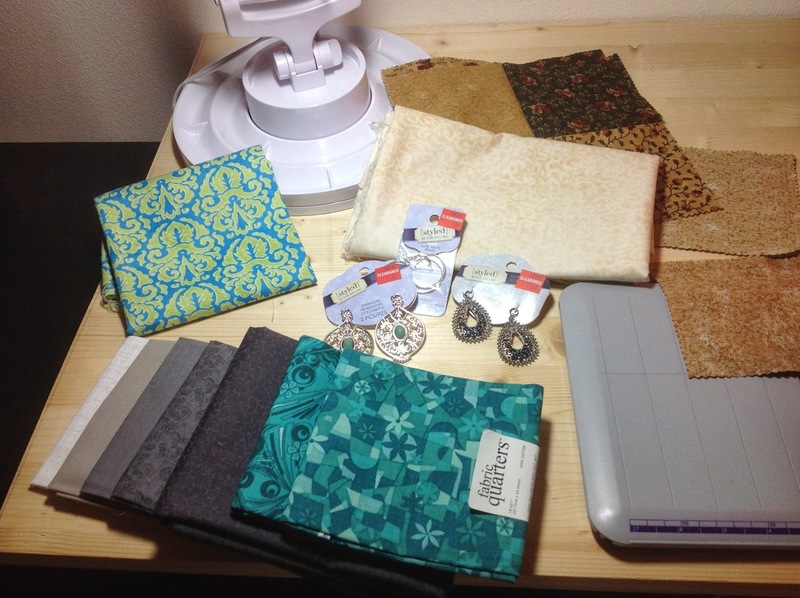 Confession: I am a fabric-o-holic. I am. I am. And I do not make apologies for it; it feeds my soul, makes my body hum with anticipation and excitement and possibilites. Hence the change in my title. I went to JoAnn's today to buy duck canvas for a spring bag I'm going to make, and, well, just to look around...a 50% off fabric for VIP customers was burning a hole in my Frenchy bag (see? I use it ALL the time, get lots of compliments on it, and well, a girl can never have too many bags). Eeek! Just looking at the picture makes me happy. So, the lime and turquoise Moroccan style one in the top at the 11 o'clock position is for a Seaglass quilt that I've yet to buy the pattern for, but I intend to, as it's SO awesome. The run of fat quarters and one 1/2 yard piece is JoAnn's contribution to my lack of greys; I think I did pretty good with the value run, as well as the value for money, ha ha. Fat quarters were on sale for $1.39 each. I am in love with Katie Clark Blakesley's "Spiced Chai" quilt in the book Vintage Quilt Revival, so these might end up there. Who am I kidding? I am in love with just about every quilt in that book! And those two teal ones might go into the seaglass quilt, or into a Bento Box quilt for which I've been collecting stuff for a year. Above the teal are 3 packs of jewellery stuff, 2 pairs of danglies, and a pack of 4 earring adaptors. I've never bought anything like this before, but I was so drawn to these, both colour-wise (I'm clearly in a blue and green phase) that I had to get them. For under $5, for all 3 packets, I was sold. I even thought of attaching these to a zipper on one of my make-up bags as a bit of bling. Finally, you see the cream fabric that I'd hoped to use my 50% off regular-priced fabric coupon. At the checkout, I found out that if the fabric is on sale, as it was in this case, for 30% off, they are not allowed to charge me the full price and then input the 50% off coupon. Bummer. Still, it was ony $7 for the yard, decent, and I "feel" it in the charm quilt...I know, I know, I have fabric in Kingsville in mind for this quilt, but my roses (oops, spoiler alert) I want to incorporate need to be 2 or 3 layers, so I will need more than one cream. This also might work in my Self Round Robin. Yay! I am on track! I see you added "Labels" at the end of your post, interesting! I followed many of your links, thanks! Ya, I finally figured out how to do that. Took the time to go in blogger Help, and Bob's yer uncle. It's supposed to help people to find my blog too. Look out, I'm going viral, lol. There's lots more I'd like to do with the blog, but it takes SO much time to figure it out. Not because of my eyes either! Love those earrings! Long story on my part, but dangly ones are part of my goal of who I want to be... someone who wears danglies!